Each guide has its own behavior, vocabulary, and sound effects. In addition to their regular animation each guide (except for the last two) has various activities that they will perform at random times. For example Rover will eventually find and start playing with a yellow smily face ball, and Scuzz will find and rummage through a garbage can. The Office Assistance included with Office 97 appear to be directly evolved from the Bob Guides. Part of the information you must include when creating a Bob account is your birthday. 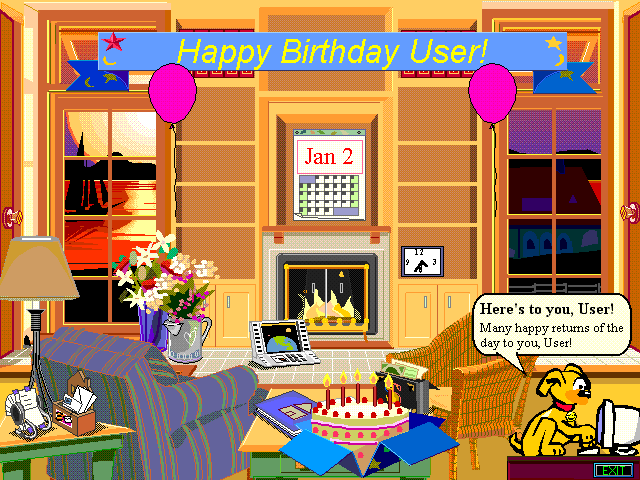 Here rover wishes a user named User a happy birthday.